(coming out on 14 March). The Prologue was transferred from the final printing proof so there may be some formatting errors to forgive; otherwise, enjoy! Eric hated this question above all others, because adults seem to care about little else when it comes to adolescent children. And without a good answer . . . well, that quickly turns a conversation awkward. Eric shifted, liking this meeting less and less. He thought hard but drew a blank. Mr. Pickney raised his eyebrows expectantly. “I . . . uh . . . I’m pretty good at flying kites,” Eric answered seriously. Eric returned to his classroom frustrated, as he always was after meetings with school counselors. Now, he thought, I’ll return to my science class, where I will get a mediocre grade, just like the rest of my mediocre life. Eric sat down at his desk, studying his classmates with jealousy. Brandon was a great all-around athlete. Jeanie boasted an incredible singing voice. Tina could work out any math problem you gave her. Even Christopher—yes, Christopher—with his poor hygiene and thick-rimmed glasses, was unparalleled with his computer knowledge. While scanning the rest of the room, Eric could pinpoint redeeming qualities of each of his fellow students, regardless of whether they were popular, outcasts, unknown, or even hated. Eric turned his thoughts back to himself. There isn’t one thing I’m good at, he thought. Not one. He sighed, succumbing to his useless fate. the captain’s charts in his mind. “And not a moment too soon, either,” Mr. Gary appended. Samuel could not have agreed more. He gazed across the deck of the Rosemary, strewn with loose rigging, splintered spars, tackles, and blocks. He turned around to gauge their progress, judging their distance from a lone, barren island a couple of leagues back. Though the breeze remained constant and in their favor, the ship crawled forward sluggishly. Samuel knew this to be a result of the countless leaks she sprang during the turbulent night. Still looking back, Samuel saw the mist to the south building up into a dark, menacing cloud gathering in the east. the mid-morning sun as the San Fernando Channel edged closer. The jut of rocky mainland fell out into the ocean just short of the island chain stretching off to the north, marking an obvious path between the two land masses. Channel without crossing spars with another ship. Though another ship at this point and in their condition might bring relief, Samuel felt annoyed more than anything. With Port Raleigh so close, the last thing he wanted was to stop and hail another ship. He would rather go straight to port for aid. “They’ll be wantin’ to know how we weathered the storm, I shouldn’t wonder,” Mr. Gary noted, after passing along the proper message to the lookout. His lack of enthusiasm suggested that he did not look forward to frequent stops on the way into port either. “Looks like a merchantman, sir!” the lookout yelled from his perch in the crow’s nest. By that time they had traveled enough that Samuel could see the ship forming on the horizon himself. He was somewhat puzzled. The ship headed northward, as if bearing straight for the Montes de Oca islands. There were no ports or settlements on any of the islands. Nor did the wind constitute a tack in that direction if the ship simply intended to exit the channel. No, she just ran a straight line between the islands and the mainland. Before Samuel could reply, the two seamen observed the merchant ship come about. By the time the captain, somewhat frazzled, made his way to the quarterdeck, most of the crew had taken a heightened interest in the ship that now careened toward them with all sails set. “What’s the problem?” the captain asked, his voice still hoarse. The ensuing silence as the men awaited the verdict was only tainted by the continual sound of the bilge pumps, which the men had been working unceasingly since the storm. “What?” Mr. Gary called up impatiently. The tone of the lookout’s voice told them all they needed to know. “Bring her about,” the captain barked, not even waiting to hear the rest of the lookout’s report. Samuel did not hesitate putting the orders into action. Although no one said anything, he could sense the deepening of the somber morale of a crew that had been through too much to be able to support another setback like this, especially with relief so close. even if they did know it, at least it showed that the captain would not give up easily. Samuel came up to the captain’s side and stood for a moment as they both stared off the back of the ship, monitoring their pursuers. “Not many pirates indeed. I caught sight of the flag as we were coming about, Samuel,” the captain said quietly. Samuel’s heart sank. Impossible. The captain must be mistaken somehow. Even as he thought it, however, Samuel knew the captain could not mistake something that big. If he was right, then that meant that where there was one Willard, there was another close by. He gripped the taffrail. The infamous Willard Pirate Twins blocked their path into Port Raleigh. They would have done better drowning in the storm. "To be considered a textbook for future pirates. Reeder capably addresses the adventure and danger of the lifestyle of a pirate." "If you can't do, teach. If you can't pirate, pirate hunt. If you can't do either, write a story about them--that's what Reeder did." "Technically, I'm a privateer, but as a mariner with a flair for the dramatic, I can appreciate the excitement, innovation, and cleverness of Reeder's tale. 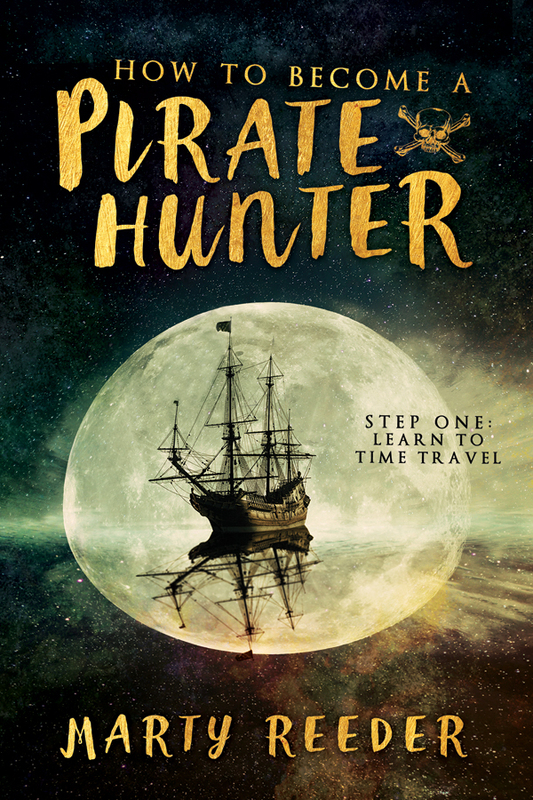 A must read for anyone looking to join the world of pirating--er, or privateering."